This Website introduce good accommodations in the area near Mt. Fuji to foreign travelers who want to stay near Mt.Fuji. In the area near Mt. Fuji, the Kawaguchiko area is the best for climbing Mt. Fuji since there are a lot of accommodations with good access to Mt. Fuji. The Hakone area is an area with very good onsen (hot spring) and is very popular among people from overseas. Visitors can enjoy the onsen and also experience the traditional Japanese style hotel (ryokan). Other than the Hakone area, the north area of Mt. Fuji is a good spot from which to view Mt. Fuji. It is located on the west side of Tokyo and it takes about two hours from Tokyo by train or expressway bus. If you would like to enjoy the view of Mt.Fuji, we hope you will take the opportunity to visit the north area. If you want to stay in accommodations near Mt.Fuji, please use this portal site. You will find best accommodation as you wish! 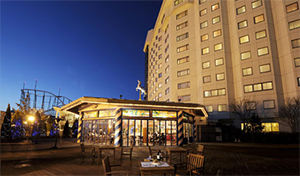 This hotel is recommended for groups and families. All rooms and the open-air bath have a magnificent view of Mt. Fuji and Lake Kawaguchi. Please enjoy the various appearance of the Mt. Fuji changing every time. This hotel is a long standing hotel found in 1932. It is based at the shore of Lake Kawaguchi and it has an observation room with a magnificent view of Mt. Fuji. You can also enjoy the view of Mt. Fuji from the open-air bath connected to the room. The Fuji View Hotel stands just on the shore of Lake Kawaguchi. Guests can appreciate natural beauties including the garden in the hotel property. Kasuitei Ooya is contemporary Japanese style inn standing just on the shore of Lake Kawaguchi. It has renovated rooms with private open-air bath and observation bathroom. There are four types of room available: Dormitory room, Japanese-style room, Western-style room and room with private outdoor bath. The hotel is very popular among our overseas guests. This hotel is located next to the FujiQ Highland and it is recommended for visitors who would like to enjoy both the view of Mt. Fuji and big roller coasters. HOTEL Mt. FUJI is situated at high above the Lake Yamanaka. 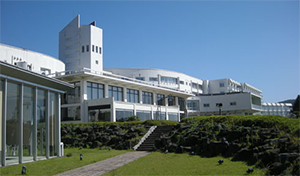 Hotel Mt.Fuji provides an observation deck and beautiful lawn that offer panoramic views of the lake and the mountain. It is a very convenient hotel located near the Hakone Yumoto Station. Visitors can enjoy Chinese food and French food other than the traditional Japanese food. A panoramic view of Mt. Fuji and Lake Kawaguchi from the Kachi-Kachi Yama Ropeway. The Fuji Hakone Pass is valid for 3 days and exclusive to non-Japanese visitors. It covers excursion travel in the popular Fuji and Hakone areas. The pass includes discount round-trip transport from Tokyo (Shinjuku) (on the Odakyu Line and the Chuo Highway Bus), unlimited use of specified transport in the Hakone and Fuji areas, and discounts on entrance and other fees to about 60 museums and restaurants. You can take the Hakone Tozan Line, which runs along the steep slopes of Hakone's mountains, famous as tourist attractions, or the Hakone Sightseeing Cruise over Lake Ashi. The Hakone/Fuji area is rich with nature, so you can see various landscapes in each season. From Hakone-machi to Tōgendai passing by Ashinoko sky line stop. It takes about 40mins, 840yen (From Hakone-machi to Tōgendai). From Hakone-Yumoto Station to Gotemba Premium outlets. It takes about 60mins, 1,240yen(From Hakone-Yumoto Station to Gotemba Premium outlets). Direct bus will be around from Haneda Airport to Hakone Yumoto! A direct bus to and from Haneda Airport and Hankone Yumoto will be in service. Let's Climb Mt. Fuji and Get The Climbing Mountain Certificate! Foreigner tourists who successfully climbed to the top of Mt. Fuji can receive a "Mt. Fuji mountain climbing certificate". Yamanashi Prefectural Art Museum possesses the most collections of Millet in Japan. In celebration of the 30th anniversary of the opening of the museum, the Millet Museum opened this January. Visitors can also enjoy the collections of other artist from the Barbizon group other than Millet. Saiko "Iyashi no sato NENBA"
A place where it reconstructed the thatched roof house which used to be poprlar once. Saiko "Iyashi no sato NENBA" reconstructed more than 23 houses of thatched roofs. JR Otsuki Station - (Fuji Express Line) - Kawaguchiko Station - (Bus) - Saiko "Iyashi no sato NENBA"